The Green Hornet TV show was a 30 minute super-hero fantasy series on ABC about a newspaper publisher and his martial arts expert sidekick who donned masks at night and pursued criminals in their high tech automobile. "Another challenge for the Green Hornet, his aid Kato and their rolling arsenal the Black Beauty. On police record a wanted criminal, the Green Hornet is really Britt Reid, owner publisher of the Daily Sentinel. His dual identity known only to his secretary and to the district attorney. And now to protect the rights and lives of decent citizens rides the Green Hornet." Van Williams and Bruce Lee appeared as The Green Hornet and Kato on three episodes of "Batman". Their titles were "Batman's Satisfaction", "A Piece of the Action" and "The Spell of Tut". On those episodes we found out that Bruce Wayne and Britt Reid had been rivals when they were kids. The creators of the Green Hornet character also created the masked western hero, "The Lone Ranger". In fact, it was stated on this series that the masked man was an ancestor of Britt Reid! The Green Hornet's automobile was named "Black Beauty". It was a modified Chrysler Imperial. Kato was Bruce Lee's first role on an American TV series or movie although he had appeared prior to that in Asian projects. Bruce said that the only reason he got the role was because he was the only Asian they could find who could pronounce "Britt Reid" properly. This author suspects that his martial arts talents might have had something to do with it too however. There was also a Green Hornet Radio Show. It was so successful that it inspired Green Hornet comic books, film serials, this TV series and several movies! 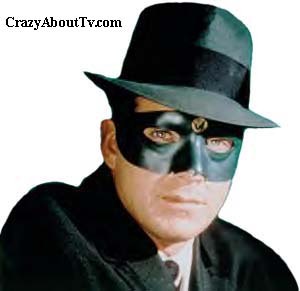 Thank you for visiting our Green Hornet TV show page!